Report observations that will feed into the annual sea turtle census. Especially in Asia and Central America turtle meat is still a source of food in local communities. During Easter in Mexico it can come to mass killings of up to 5000 turtles to consume their meat. Some turtles, like the hawksbill turtle, have beautiful shells which have been used to create jewelry and other luxury items. 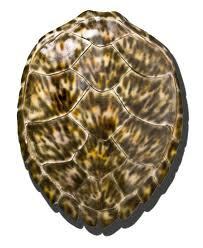 Because of this the population of hawksbill turtles is said to have declined 90 % in the last 100 years. 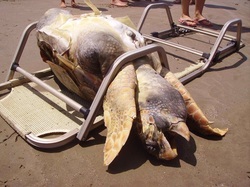 The greatest threats to sea turtles result from fishing. Virtually every form of fishing can impact sea turtles from the simplest bottom fishing hook the the large fishing boats that don’t only kill the target fish, but also sea birds, sharks, dolphins and sea creatures. Remnants from a fish trap caused the death of this juvenile green turtle. Fishing gear can be lost as a result of storms and when they drift sea turtle look for food and shelter amongst the debris. A rope from this discarded fishing gear entangled around the left front flipper and it could not get loose, and eventually drowned. Two boats are operating in tandem towing a net between each other in order to corral and haul record catches. 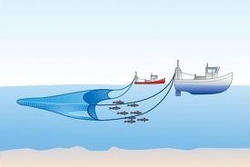 The success of pair trawling is also so high because if one boat seems to chase the fish away, two vessels will herd them together. It is reported that pair trawling brings in up to 6 times higher quotes than single trawling. Bycatch is inevitable. Lines stretching 130 km / 80 miles or longer with 1000 of baited hooks allow fishermen to reel in huge catches. The fishermen set the lines afloat for between 12 and 24 hours. This is enough time to kill many sea birds, dolphins, sharks, turtles and other marine life that is not part of the target fish. 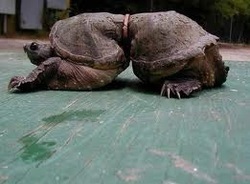 It is believed that every year around 40’000 marine turtles are killed in this way. 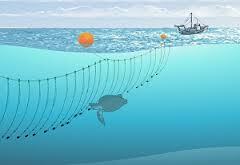 Mesh net up to 65 km / 40 miles long that efficiently catch the target fish. Fish get caught in 3 different way: wedged – held around the body by the net, gilled – held by the mesh slipping behind the gills, tangled – held by teeth, spines or other extremities without the body penetrating the mesh. Gill nets are so effective that their use is closely watched by fisheries management and enforcement agencies, as mesh size and string strength have an enormous influence on by-catch. 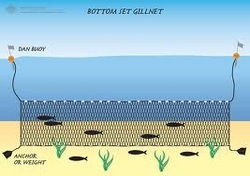 Dragging the sea floor to collect bottom dwellers causes physical damage by destroying structures and stirring up silt. The physical damage that bottom dredging causes is irreversible and has an enormous negative impact on the environment. Bycatch makes up to 2/3 more of the catch than the target species. For turtles it is a danger to their feeding grounds, especially the ones who exclusively eat sea grass. Many stranded turtles are found killed by plastic they mistook as food. Scientists opened some of their stomachs to find up to 1000 pieces of plastic in their digestion system. Their death was either slowly through the impossibility to digest plastic which must have caused an almost unbearable pain over a long period of time or they suffocated to death which might was quicker but equally torturous. And some may not die but the plastic leaves them with lifelong disfiguration. Far off the main landmasses floats a massive amount of debris, plastic and lost or discarded fishing nets. The Great Pacific Garbage Patch that lies in the north pacific sub-tropical gyre spreads between 402’336 sq km / 250’000 sq miles and 9’656’000 sq km / 6’000’000 sq miles. The size is depending from how you look at it; all pieces larger than 1mm cover about the size of Germany, but the size of the entire garbage pattern with the even smaller pieces is about the size of the United States. And plastic does not decompose, so fish and other marine life will feed plastic from their earliest stage of life. This results in the suffocation of marine animals and dead zones like in the northern part of the Gulf of Mexico. There is an estimated amount of 405 dead zones all over the world which measure from a couple square miles / square km up to 27,000 square miles / 70,000 square km, which equals the size of South Carolina. This reduction of healthy eco systems for both nesting and feeding grounds has strong impacts on sea turtles. 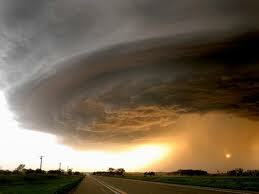 This term describes mainly oil spills, urban and agricultural run-offs of chemicals, sewage and fertilizer. Oil and chemicals harm turtles mainly through the accumulation of these materials in their diet through prey species. Sewage and fertilizer are nutrients and lead to eutrophication, uncontrollable algae blooms which absorb the oxygen from the sea water. Female turtle instincts lead them back to the beach where they were born to lay their eggs on the same beach. Nowadays they find on these beaches not the soft sand but concrete, harbors, hotels, and other buildings which hinders them on coming to the beach. Their instinct doesn’t tell them to go somewhere else. The hatchlings die in their mother’s womb and are eventually discharged from the body. No beaches, no nests, no turtles. About 40 % to 60 % of the world population live within 100km of the coast or are directly dependent from it as a food resource or as a direct source for earning money in tourism and related branches. 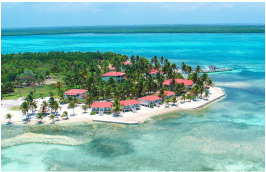 Population density and economic activity are constantly increasing and therefore the ecosystems of the coastline suffer increased pressure. In other words cities are expanded and hotel complexes start to destroy even the most remote beaches and coasts. So almost no pristine nesting beaches are left for turtles. Female turtles need to feel safe about the place they lay their eggs. 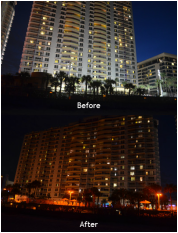 Artificial lighting from cities and hotel complexes disturb, distress and discourage them, which will either let them find less fortunate places to nest or they release their eggs into the water after unsuccessful attempts of nesting. Hatchlings have an innate instinct that leads them to the brightest light source, which normally is the moon. Artificial lighting draws hatchlings inland where they die of dehydration or predation. This is a way of humans to protect their homes and investments from beach erosion; they build walls or ship sand from different areas to reduce erosion effects. This is an enormous impact on the natural balance of the ecosystem and prevents female turtles from coming to the beach to nest. Hotel infrastructure and humans nightly activities on the beaches will increase number of false crawls where female turtles make attempts of nesting, but through disturbance and distress will return to the sea without nesting. Several unsuccessful crawls might force the female to release the eggs into the water and stop completely the nesting process. Beach furniture that lies around unattended can furthermore lead to tragic accidents. Rising sea levels will remove important nesting beaches from the land card and possibly evolve so fast that marine eco systems won’t have enough time to adapt to the change which certainly will impact feeding grounds of turtles. Higher temperatures will have a significant influence on genetic diversity, as only female turtles will be born. Typically eggs in the lower, cooler part will evolve into males and into females in the upper, warmer part. 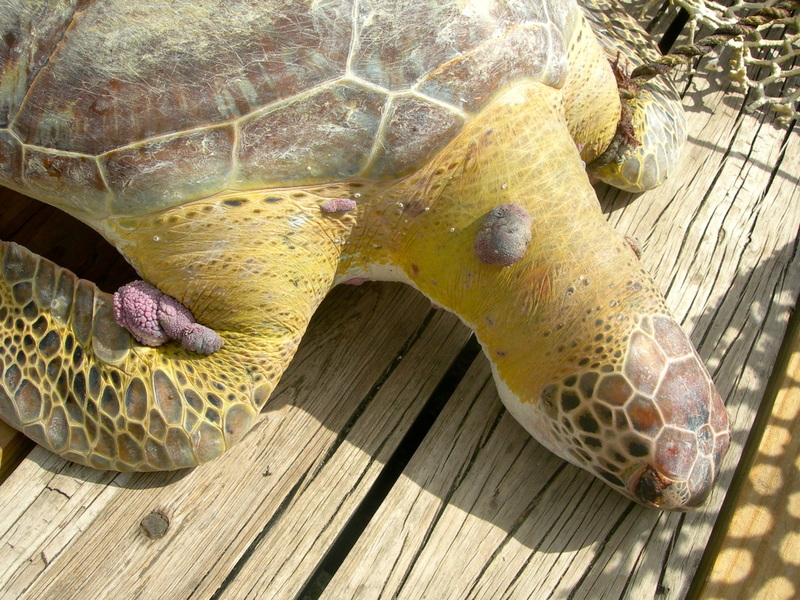 Green sea turtles especially are susceptible to fibropapilloma, a herpes-like virus that causes outbreaks of large fibrous growths on the neck, flippers, tail, eyes and mouth. 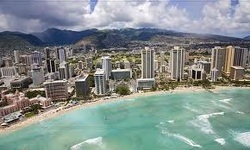 The disease is associated with coastal development and areas in Hawaii have high incidence of FP, compared to Belize where the incidence is low. The first green turtle encountered with severe FP in Belize was in Sep 2014 a couple miles off Belize City. Sadly the turtle drowned in discarded fishing gear. In the United States sea turtle hospitals and rehabilitation centers successfully remove the FP growths and release the turtles back into the sea.